Supporting the look of their Marine wedding, we styled the albums in white leather, with navy blue leather spines, silver-outlined cover photos, silver gilding on the page edges, modern silver text descriptions and volume numbers on the spine, all inside of a white leather slipcase. Since this is a Hand Crafted Elegant album, most of the pages are beautifully matted in white, with a subtle ivory liner around the photographs, as you can see below on the right. Of course, these albums also feature full-bleed, flush mounted pages, as shown on the left. 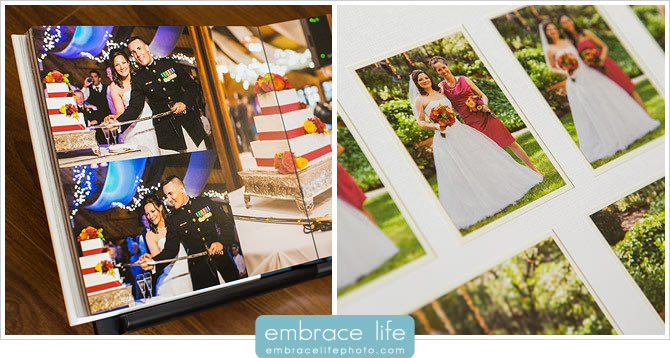 Our Hand Crafted Elegant Albums are a gorgeous blend of classic elegance and modern album styling.